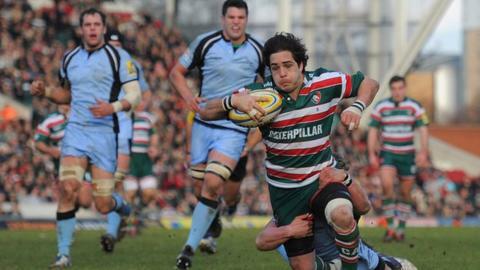 Leicester Tigers snuffed out Newcastle's mini Premiership revival with a six-try win at Welford Road. Falcons mustered a penalty in answer to first-half tries by Julian Salvi, Billy Twelvetrees and Horacio Agulla and eight points from George Ford's boot. Thomas Waldrom secured Tigers' bonus point shortly after the break, which was countered by Jon Golding's effort. Waldrom added his second and Niall Morris Tigers' sixth before Richard Mayhew grabbed a late consolation try. "George Ford ran the show well at fly-half, Billy Twelvetrees was strong in the centres and it is pleasing that we can play that well with so many back-line players missing. "It was a very dangerous game for us, but I was delighted with the all-round performance. "Newcastle kick the ball well and their defence has been very, very good, so to play as slickly as we did was a real boost. "We dominated the breakdown, our set-piece was really good and the whole performance was very pleasing. "You have to take the result in context of the ambition of the opposition. Newcastle race to the line and make the breakdown quite hard, and I was delighted with how we coped with that." "Full credit must go to Leicester because they are a quality team, and their confidence was buoyant after beating the champions away from home last week. "In saying that, this was our worst performance by a country mile and I am very disappointed by what I saw out there. "When the penalty count is 12-4 against us and we have two yellow cards to none from Leicester it is tough to take. I have the benefit of hindsight in seeing the replays, but I am mystified by some of those calls. "It is too much of a coincidence that so many of them went towards the home side, but that is not the reason we lost the game. "The reason we lost is because we were very poor in the first half whereas Leicester were very good, and we were beaten in every facet of the game." Leicester: Murphy; Agulla, Smith, Twelvetrees, Hamilton; Ford, Grindal; Ayerza, Chuter, Mulipola; Slater, Skivington; Mafi, Salvi, Waldrom. Replacements: Morris for Agulla (61), Steele for Grindal (68), Stankovich for Ayerza (68), Hawkins for Chuter (59), White for Mulipola (63), Newby for Salvi (52), Staunton for Morris (75). Newcastle: Goosen; Bedford, Helleur, Fitzpatrick, Manning; Gopperth, Pilgrim; Shiells, Vickers, Murray; van der Heijden, Swinson; Hogg, Welch, Wilson. Replacements: Sheriffe for Bedford (58), Golding for Shiells (40), Tu'ifua for van der Heijden (54), M. Mayhew for Welch (69). Sin Bin: Fitzpatrick (9), Tu'ifua (63).